After stacks of charity research, I decided to complete the Winter Slog in aid of 'International Animal Rescue' (IAR) and the ' Soi Dog Foundation', both of which you can read more about below. Any donation you are able to make will be very much appreciated. "International Animal Rescue saves animals from suffering around the world." The work of IAR includes cutting free and caring for dancing bears in India, rescuing orangutans from deforestation and captivity in Indonesia and sterilising and vaccinating stray dogs and cats in developing countries. Wherever possible they return rescued animals to their natural environment but also provide a permanent home for animals that can no longer survive in the wild. They also invest in educating the populations of people who have previously been the persecutors of the animals they have rescued to ensure a sustainable solution for the future. 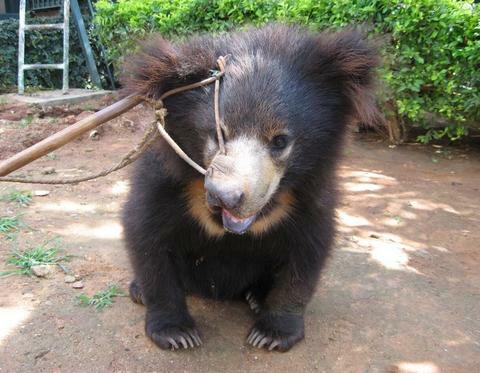 The dancing bears project in India, for example, included educating the communities who were previously relying on capturing and torturing bears for financial gain in other areas of work to ensure that these people are left with both a new understanding of animal suffering and an alternative method of income to live from once the bears had been rescued from them. This project is now complete in that the dancing bears trade in India has been STOPPED. This is an amazing result, but unfortunately, the trade has now spilled over the border into Nepal, meaning that IAR are now carrying out similar work there to continue to rescue bears and end the practise. They also now have many bears rescues from India to look after, some of which will need caring for for the rest of their lives. 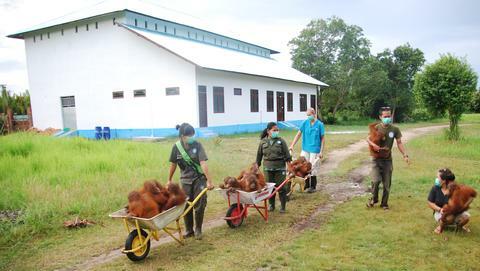 Above: Wheeling orphaned baby orangutans to baby school at the IAR rescue centre, Borneo. A recent development of the orangutan rescue project in Indonesia has been the building of a pre-release site ‘island’ of land within the rainforest that was purchased by the charity. The island is 19 hectares and has been fenced and moated so that poachers can not enter and orangutans that are in the pre-release stage of their rescue can learn to fend for themselves in the jungle safely. The charity hope to build another island to house those orangutans who unfortunately can never be released into the wild. These orangutans, sadly, currently spend most of their day in enclosures do to limited resources. International Animal Rescue also work with other like-minded organisations and government departments to strengthen legislation to protect animals from cruelty and neglect. Above: 'Elvis' the ex-dancing bear, recently rescued from the spill of the practise over the border into Nepal. In the long term, I hope to be able to fund a larger tangible goal in terms of fundraising for the charity, such as buying the land required for the new orangutan island in Borneo (this would be huge!). In the short term, I hope to raise £2,000 for the charity's general cause. 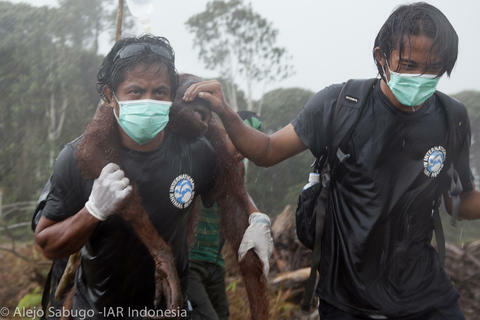 Above: Rescuing a mother and baby from deforestation in Borneo. 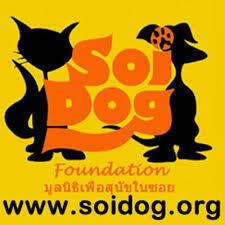 Soi Dog Foundation is a not-for-profit, legally registered charitable organization in Thailand, the UK, United States, Australia, France and Holland. 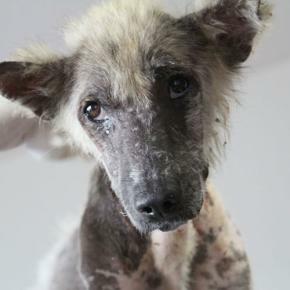 Soi Dog helps the homeless, neglected and abused dogs and cats of Thailand, works to end the dog meat trade throughout the region, and responds to animal welfare disasters and emergencies. They aim to set an example for the Asian region on how to humanely reduce the number of unwanted dogs and cats through spaying and neutering, and to better the lives and living conditions of the stray dogs and feral cats of Asia. Thousands of dogs have been treated for injury and disease by providing emergency and ongoing veterinary treatment for abused and neglected street dogs and cats. Soi Dog also runs a shelter and rehoming center for over 300 dogs that have been abandoned or abused and subjected to sometimes terrible cruelty. 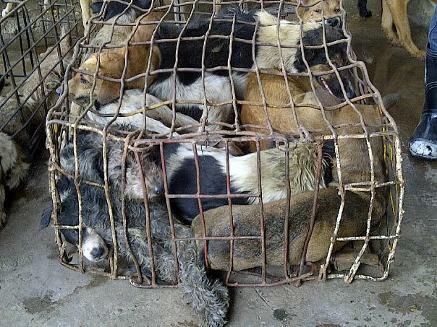 They take in injured and starving strays from the streets of Thailand, as well as targeting, tracking down and capturing groups operating illegally in the dog butchering trade. Many dogs that are rescued are rehomed abroad, taken home by volunteers returning after spending time on the project in Thailand. 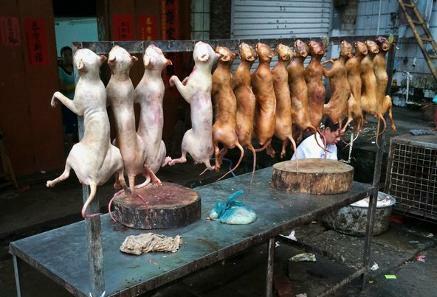 They alsofeed hundreds of dogs and cats who live in temples, who have been rescued from the dog meat trade, and more. 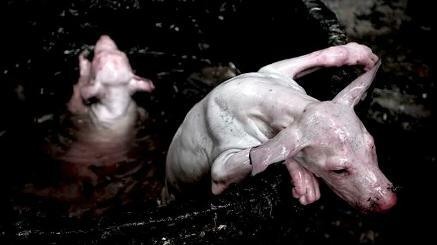 Above: I couldn't understand what was happening in this picture, so I got in touch with Soi Dogs, who told me that they believe that these are dogs trying to escape from boiling water. I first found out about the charity through Facebook after my Mum sent me a link to a horrific story about a dog who was attacked by drunken men with knives on the streets of Thailand, suffering horrific injuries. 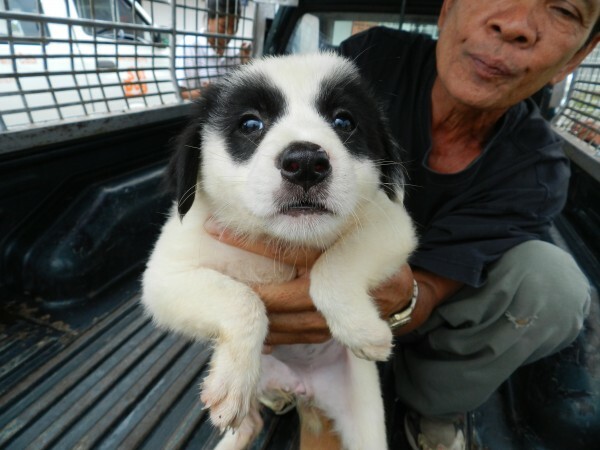 He hid, terrified, in a bush for several days before the man who often fed him found him and reported him to Soi Dogs, where he was nursed back to good health. Having looked into the charity and what they do, it's sad to realise that this is very much a norm where the charity is operating. As well as needing general funds to care for these animals, Soi Dogs are planning to build a new animal hospital in the region. This will cost upwards of $500,000 to complete. In the short term, I hope to raise $2,500 to help the general cause of the charity. In the long term, I hope to make a significant contribution towards the cost of the new hospital, such as funding an X-Ray unit or similar, which I will be able to finalise when the specific needs of the hospital fund at the time of the Antarctica expedition are clearly defined.